The new RUBY 7 HD has a larger screen, high-definition image, and enhanced functionality to meet the needs of today’s low vision consumers. The unique PivotCam™ camera offers a wide range of viewing modes for reading, writing, distance viewing, and even a mirror-image self-view. The RUBY 7 HD combines convenience and flexibility as the leader in the next generation of handheld video magnifiers. The all-new portable RUBY 7 HD makes reading easier. The seven-inch screen can display more text, and magnifies materials up to 24 times. This ultra-portable device can go anywhere with ease. The RUBY 7 HD is available in two models: RUBY 7 HD and RUBY 7 HD+*. 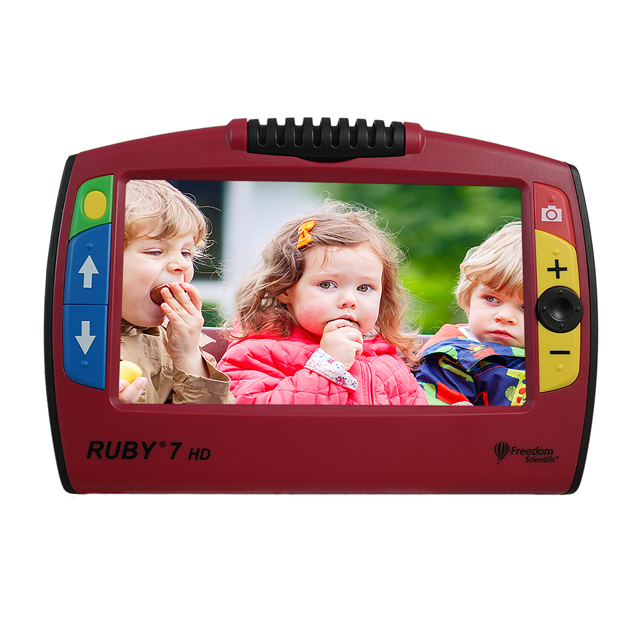 RUBY 7 HD is offered in traditional red with color buttons. RUBY 7 HD+ is offered in gray with high-contrast, black and white buttons.